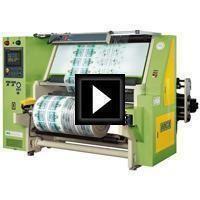 Rewinding Machine and Inspecting Machine Video(FSE-2) - HCI Converting Equipment Co., Ltd. Surface inspecting for all kind of round roll such as flexible packaging, electronics, TFT-LCD and optical materials. Defective inspection of the printed film and laminates. Convert small rolls into big rolls, or vice versa. Re-reeling operation of slit roll with uneven edges or tension.